On any given weekday, a visitor is free to walk through the buildings of the Berkeley campus, but aside from a few exhibits and posters, how much can one learn about the research going on there? Cal Day, the university-wide annual open house, was begun specifically to give the public a close-up view of that research...often presented in fun and engaging ways for children and adults alike. Cal Day 2005 was held on Saturday, April 16, and being a beautiful sunny day, large numbers of visitors descended on the campus. Historically, the Valley Life Sciences Building has always been a popular target for families and school groups, and this year was no different. The fascinating plant displays of the Herbaria and the skeletons, live lizards, and snakes of the Museum of Vertebrate Zoology are big crowd magnets, but throw in UCMP’s dinosaurs and fossils, and you have one busy building! 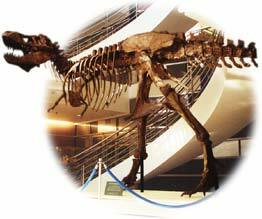 All day long, the T. rex (above right) in the Wallace Atrium, was ogled by thousands of inquisitive Cal Day visitors. Paleontologists,” back in the 1940s and 50s. Wesley Gordon, a teacher and science coordinator for the San Lorenzo Unified School District, and many of his students (ranging in age from 7 to 13), unearthed one of the best preserved fossil sites in North America. The Irvington fauna included mammoths, short-faced bears, saber-toothed cats, a musk ox-like bovid, camels, horses, dire wolves, mice, fish, and freshwater molluscs—over 58 species of fossil animals in all.